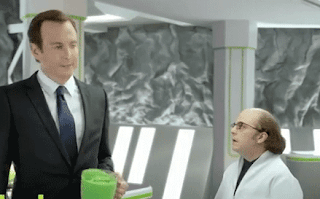 The Hulu Super Bowl 2012 Ad staring Will Arnett has been released. The Hulu Super Bowl 2012 is titled Huluboratory. Hulu reveals the Evil(er) Plot To Destroy The World with Hulu Plus, the latest alien weapon to turn human brains into #mushymush. Will Arnett unveils the "Hulu boratory" -- a hive of R&D, where aliens invent sinister ways to rot human brains. Watch the Hulu Super Bowl 2012 Ad promoting Hulu Plus below.